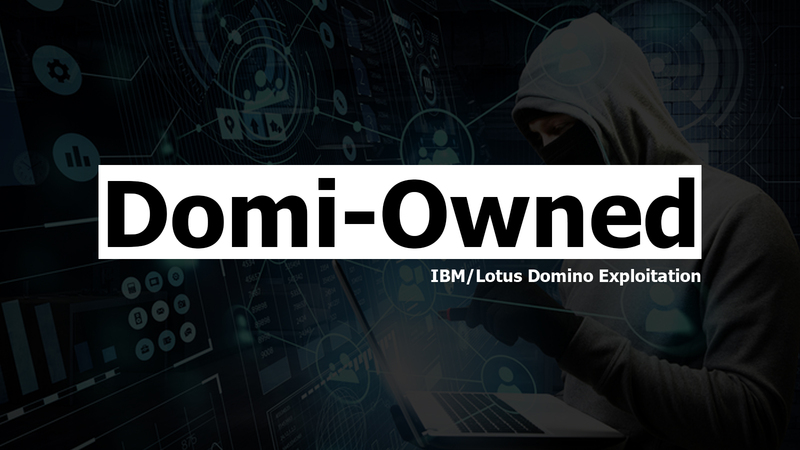 Domi-Owned is a tool used for compromising IBM/Lotus Domino servers. Note: Tested on IBM/Lotus Domino 8.5.2, 8.5.3, 9.0.0, and 9.0.1 running on Windows and Linux. Run pip3 install -r requirements.txt to install the required python modules. A valid username and password is not required unless 'names.nsf' and/or 'webadmin.nsf' requires authentication. Running Domi-Owned with the fingerprint action argument, and a URL will attempt to identify the Domino server version, as well as check if 'names.nsf' and 'webadmin.nsf' requires authentication. If a username and password are given, using the --username and --password arguments, Domi-Owned will check to see if that account can access 'names.nsf' and 'webadmin.nsf' with those credentials. To enumerate what common or default Domino directories are accessible, run Domi-Owned with the enumerate action argument, and the server URL. Optionally, supply Domi-Owned with a username and password, using the --username and --password arguments, to see what directories that specific user has access to. To use a custom directory wordlist supply Domi-Owned with a file containing a list of web directories using the --wordlist argument. To perform a reverse brute force attack against a Domino server, run Domi-Owned with the bruteforce action argument, the server URL, and a list of usernames. Optionally, a password can be specified with the --password argument. If a password is not provided, Domi-Owned will use the username, from the username list, as the account password (i.e. 'admin:admin' or 'jsmith:jsmith'). Domi-Owned will then try to authenticate to 'names.nsf', returning successful accounts. To dump all Domino accounts with a non-empty hash, run Domi-Owned with the hashdump action argument and the server URL. Optionally, supply Domi-Owned with a username and password using the --username and --password arguments. This will print the results to the screen and write the account hashes to separate out-files, depending on the hash type (Domino 5, Domino 6, Domino 8). The Domino Quick Console is active by default; however, it will not show the output of issued commands. A workaround to this problem is to redirect the command output to a file, in this case 'log.txt', that is then displayed as a web page on the Domino server. If the quickconsole action argument is given, Domi-Owned will access the Domino Quick Console, through 'webadmin.nsf', allowing the user to issue native Windows or Linux commands. Optionally, supply a username and password using the --username and --password arguments. Domi-Owned will then retrieve the output of the command and display the results in real time through a command line interpreter. Type exit to quit the Quick Console interpreter. Upon exit, Domi-Owned will delete the 'log.txt' output file.